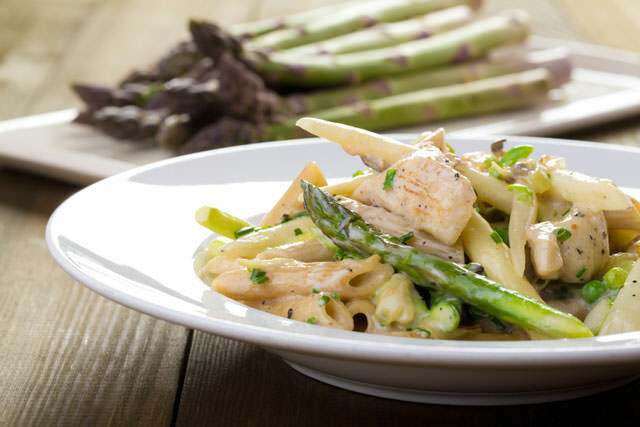 This is a light but incredibly tasty pasta dish that’s healthier than traditional pasta dishes because of the asparagus cooked in the broth with sauteed garlic and seasoned chicken. A simple, yet delicious recipe. Bring a large pot of lightly salted water to a boil. Add the pasta and cook until al dente, then drain and set aside. Warm 3 tablespoons olive oil in a large skillet over medium-high heat. Stir in the chicken, and season with salt, pepper, and garlic powder. Cook until the chicken is cooked through and browned, which shouldn’t take more than 5 minutes. Remove the chicken to paper towels. Pour the chicken broth into the skillet. Add the asparagus, garlic, a pinch more garlic powder, salt, and pepper. Cover and steam for about 10 minutes. Return the chicken to the skillet, and warm through. Mix the chicken mixture with the pasta. Let it sit for about 5 minutes, then drizzle with 2 tablespoons of olive oil, and sprinkle with Parmesan cheese.